Now that you understand the basics of effectiveness rates—how they’re calculated, and what they mean—we can dive into the research and start to explore the Marquette Method’s effectiveness rates for women in regular cycles. (Breastfeeding women, I haven’t forgotten about you. You’re up next, but in the meantime, read this). Spoiler Alert: I teach the Marquette Method, and the research shows it’s highly effective, in perfect use and in typical use. Here’s the interesting thing about the Marquette Method of NFP: It’s not just one set of instructions. Marquette takes a multifaceted approach to tracking your fertility. There are a number of biological indicators women can use to track their fertility, and Marquette’s system integrates the most reliable of these indicators. This allows Marquette to be adapted to fit the needs of each couple. Each biological indicator of fertility tracking that is offered by the Marquette Method is strongly supported by research as a reliable means of predicting or confirming ovulation in a woman’s cycle. No matter which indicators you are tracking, Marquette’s regular cycles protocol also includes a fertility algorithm. This is a simple mathematical formula that uses a couple’s own cycle history to help identify the beginning and the end of the fertile phase in the woman’s cycle. Marquette’s monitor-only approach is the one that most NFP-practicing couples are familiar with. Couples following this form of Marquette use a Clearblue Fertility monitor to track the woman’s urinary hormone levels (estrogen and luteinizing hormone) throughout her cycle. The monitor readings are applied to the Marquette Method algorithm, which then identifies which days are infertile, and which days are potentially fertile. It’s called the monitor-only approach because women following it do not track a secondary sign, such as mucus and/or BBT. 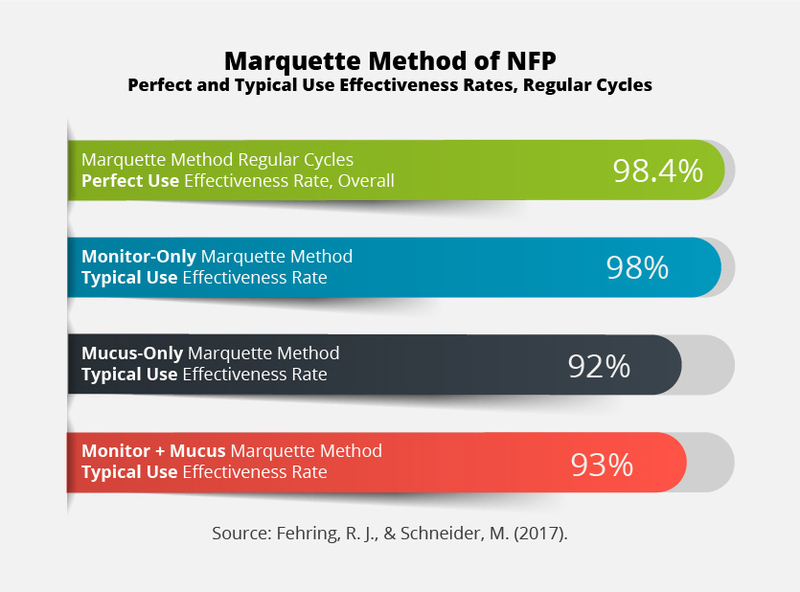 Another approach to the Marquette Method of NFP is the mucus-only approach, in which the woman tracks how her cervical mucus changes throughout her cycle and similarly applies her mucus observations to the Marquette Method algorithm. A third option is Marquette’s monitor + mucus system, in which the woman tracks her urinary hormone levels using a Clearblue fertility monitor as well as tracking cervical mucus observations. Information from both indicators are applied to the algorithm. Women following the Marquette Method of NFP also have the option to track their basal body temperature (BBT). Women can pair BBT observations with urinary hormone testing and/or mucus observations. With so many tracking options available in the Marquette Method, you may wonder…which one is the best? Is simpler better? Or is it a case of “the more the merrier”? Well, the research is pretty clear, but the answer to the question “Which one is better?” is more complicated than you might think. Which Approach is the Most Effective? As I mentioned in my previous blog post, one of the weightiest considerations when choosing a method of pregnancy avoidance is “How effective is this method?” Luckily, that’s a question that the research can answer. Because Marquette undertook research into the comparative effectiveness of three of their protocol variants—the monitor-only method, the mucus-only method, and the monitor + mucus method, we’re able to see a side-by-side comparison of which approach was the most effective. How Effective is the Marquette Method of NFP for Women in Regular Cycles? The researchers didn’t calculate the perfect use effectiveness rates for each subgroup of women, so for the purpose of this analysis, we’ll be focusing on the differences in typical use effectiveness rates between the various approaches of fertility tracking within the Marquette Method. The typical use effectiveness rate for the 212 women following Marquette’s monitor-only approach was 98%. 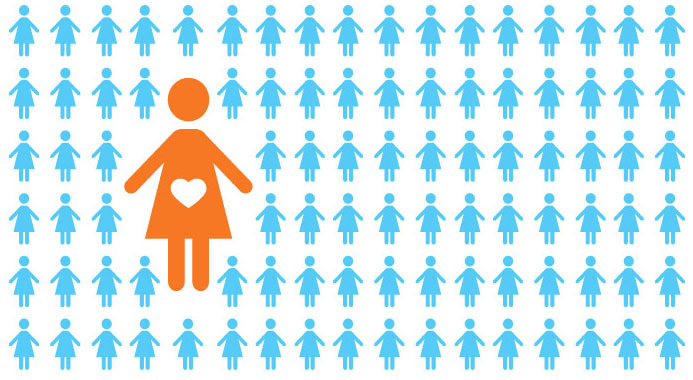 To visualize, when looking at the typical use numbers, 2 in 100 women became pregnant in the study over the course of the year while following Marquette’s monitor-only method. As I explained in my last post, perfect use and typical use effectiveness rates are meant to be compared, and a small gap between these two rates means that most of the women in the study achieved the desired outcome (they didn’t become pregnant), even taking into account real world conditions. The typical use effectiveness for the 118 women following Marquette’s mucus-only method was 92%. That’s quite a bit lower (6% lower) than the typical use effectiveness for the monitor-only group, and it’s also quite a bit lower than the overall perfect use effectiveness rate. To visualize, this means that 8 in 100 women became pregnant over the course of the year while following Marquette’s mucus-only approach to fertility tracking. Mucus-based methods of NFP vary significantly in how they classify mucus and in how these observations are used to identify the fertile window. It’s so important in NFP research that the effectiveness rates are calculated for a specific method, and not just a fertile sign or general approach to pregnancy avoidance (Peragallo Urrutia et al., 2018, p. 592). There are a number of different mucus-based methods of NFP (Creighton, Billings, FEMM, Family of the Americas). The effectiveness research into one of these methods isn’t necessarily transferable to another method, because they each have their own specific way of identifying fertile/infertile mucus. Each are distinct methods, and they each have their own distinct effectiveness rates. People who use NFP often assume that the more fertile signs you can track, the more effective the method will be. It’s a reasonable assumption. It is true that double-check methods of NFP have been shown, in general, to be more effective than single-check methods of NFP (Freundl, 1999). So…how did women who followed Marquette’s monitor + mucus approach fare? It would be reasonable to hypothesize that women who were tracking their mucus and testing their hormone levels using a Clearblue Monitor would be more successful in avoiding pregnancy than women who were only tracking one of these things. But when the researchers looked at typical use, that’s not how it turned out. That’s only slightly better (1% better) than the typical use effectiveness rate for women following the mucus-only approach. And it’s 5% less effective, in typical use, than women who didn’t track mucus at all and simply relied on the monitor readings. For a visual comparison, let’s look at the results of the study, with each of Marquette’s approaches to fertility tracking stacked up side-by-side. So, what do we, as NFP-practicing couples, make of these results? What do I, as a Marquette Method instructor, do with these results? How can we explain this variance? One possibility (and this is one hypothesized by the researchers) is that abstinence is hard. As they put it, “One of the reasons why the fertility monitor plus algorithm might be more effective is that it is simpler to use, objective, and requires less periodic abstinence than the cervical mucus monitoring plus algorithm” (Fehring & Schneider, 2017, p. 48). The monitor + mucus method was designed to be more conservative. It tends to identify a longer fertile window than the monitor-only approach. With the monitor + mucus protocol, both the monitor results and the mucus symptoms need to point to infertility for the couple to discern they are in an infertile phase. But a more conservative approach to fertility tracking does not necessarily mean the method will be more effective, particularly when you look at the real-world situation of the typical use effectiveness rate. And the research proves it. What this study showed is that tracking mucus in addition to the monitor resulted in this group of women having more babies. Perhaps confused or frustrated by the lack of objectivity of these two measurements taken together, they prioritized one sign over the other and, at least some of the time, these deviations from the monitor + mucus method instructions resulted in a pregnancy. Abstinence is hard. And most people will agree that abstinence that ultimately turns out to be unnecessary is doubly hard. The more precise we can be about the actual fertile window, the fewer days of abstinence that are required, while still keeping effectiveness rates high (Fehring & Schneider, 2014). Couples that don’t have to endure unnecessarily long stretches of abstinence may well be more likely to effectively abstain on the days that really matter. The Clearblue fertility monitor does an excellent job of measuring the reproductive hormones, and because of this, the monitor-only approach to the Marquette Method is able to identify a precise fertile window. Knowing that the monitor is providing accurate information helps couples feel confident in their identification of the fertile window. As the researchers themselves summed up in the study: “Use of the fertility monitor to estimate fertility among non-breastfeeding women provides the most secure method of avoiding pregnancy” (Fehring & Schneider, 2017, p. 43). Translation? Marquette’s monitor-only protocol is highly effective, both in perfect use and in typical use. When life happens, fewer women experience unintended pregnancies with Marquette’s monitor-only approach than with either of Marquette’s other two options. So, what’s the best Marquette Method protocol for you? The one that meets your needs, addresses your health conditions, and fits your lifestyle the best. Maximizing method effectiveness is certainly an important consideration, but Marquette still offers each of the different approaches to tracking your fertility because every woman is different. My goal is to provide you with the best possible information so that you can make an informed choice about which of Marquette’s approaches to fertility tracking is going to be the best one…for you.